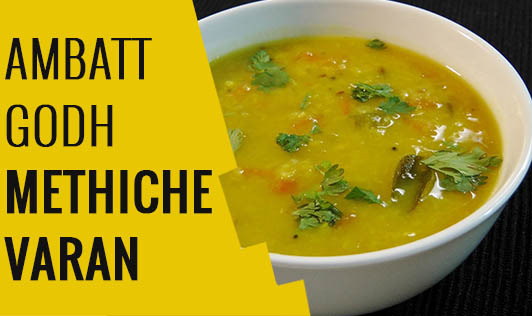 Indulge in this authentic Maharashtrian dal, loaded with methi leaves. This recipe is rich in fiber, folic acid, vitamin A, and iron, and makes for an excellent dish, especially for pregnant women. In this recipe, sugar has been replaced with jaggery, to further enhance the iron content and taste. Garlic- 2 to 3 nos. Cloves- 4 to 5 nos. • Wash and soak the dal for 20 minutes, drain, and keep aside. • Add the soaked dal, 3 cups of water, turmeric powder, and salt to taste in a pressure cooker. • Cook for 3 to 4 whistles till the dal is soft. • Cool and allow the steam to escape, before opening the lid. • Now whisk the dal with ½ cup of water and salt to taste. • Add jaggery, tamarind pulp, and chili powder, and bring it to a boil. • Add the methi leaves to the dal and cook it for 2 to 3 minutes. • Now heat ghee in a karchi, add garlic, cloves, hing, and sauté till the garlic turns slightly brown. • Finally pour this tempering over the boiling dal and mix well. Note: Mothers with gestational diabetes should avoid adding jaggery in the dal.